Electric sockets can have a number of issues/problems and yet still work. For instance: a wire can short or fray, a wire can become disconnected, or corrode at the contact, or the wires can be connected to the wrong contact altogether. These problems can cause a fire or provoke a shock. 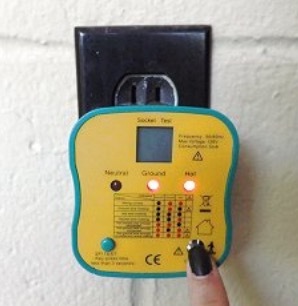 This inexpensive tester can be used over and over and gives either peace of mind or specific information about what to do. North American Plug only. Rated for 120V, 50/60 Hz.